Ya Jagoff!!! | YaJagoff Podcast - We Went Wrestling! Home YaJagoff Podcast YaJagoff Podcast – We Went Wrestling! 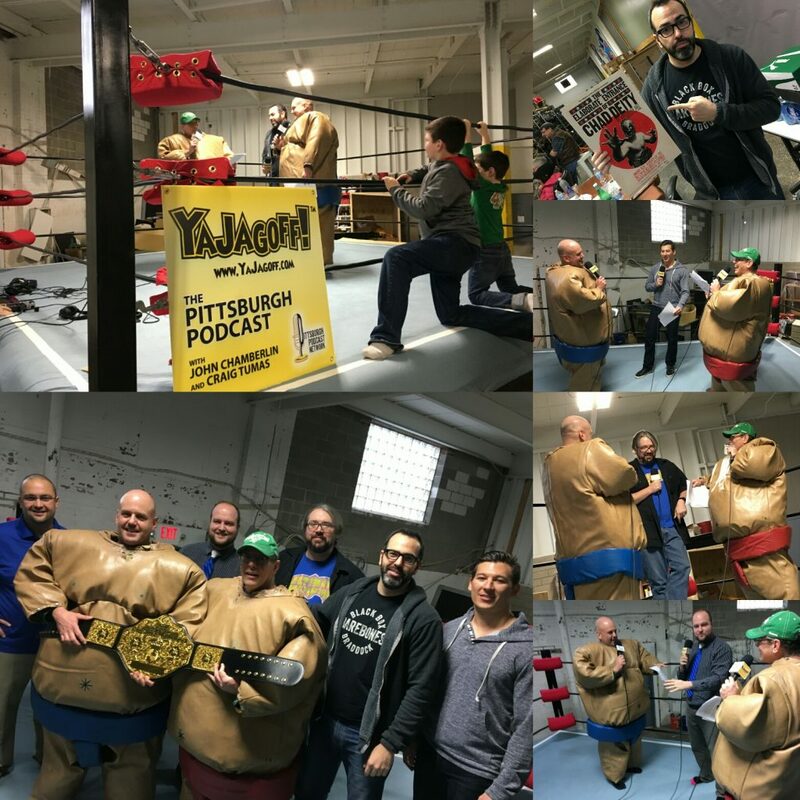 Our first podcast of 2017 is from the middle of a real wrestling ring and, we’re talking about a new wrestling play coming to Pittsburgh, a humongous sumo wrestling fundraiser at Stage AE, how Pittsburgh is a part of the pro-wrestling scene and a project to collect stories of the old Pittsburgh Studio Wrestling! If you don’t see the Player Bar above, click the one below. 00:00 Open John and Craig are in the middle of an actual wrestling ring doing the interviews while in Sumo Wrestling outfits (provided by our buds at Everyone Loves Fun Entertainment)! THANKS TO OUR SPONSOR: Team Pittsburgh Dek Hockey an internationally recognized and one of the longest running ball hockey organizations in Pittsburgh! Register your kids NOW and become part of the Team Pittsburgh Dek Hockey youth ball hockey legacy. Register here today! 13:33 Brandon Meuller, President of Seubert and Associates is going to be part of Sumo Showdown.. CEOs vs. Celebrities in sumo wrestling matches AND two professional sumo wrestlers at Stage AE this weekend. Tickets/times here. 20:03 Justin LaBar is a locally-based WWE, podcaster, co-host of Wrestling Reality video blog, writer for upgruv and, in his terms, official “wrestling nerd.” One question we DON’T ask him ….. “is wrestling real?” but we DO get his favorite finishing move! 32:31 Mike Sorg of Awesomecast and Wrestling Mayhem Show talks about his current project to recruit people to tell their stories about the old Pittsburgh Studio Wrestling! 43:26 Daniel Frankel, our friend from Everyone Loves Fun, who have us our Sumo Suits, give us HIS favorite wrestling name! Thanks to our awesome ring announcer, Frank Murgia! THANKS TO OUR SPONSOR: Team Pittsburgh Dek Hockey an internationally recognized and one of the longest running ball hockey organizations in Pittsburgh! Register your kids NOW and become part of the Team Pittsburgh Dek Hockey youth ball hockey legacy. All shows are free and available to listen 24/7/365 worldwide. Audio On-Demand in-your-hand, on smartphone, tablet, laptop and desktop computers. – ALSO available via RSS, Stitcher Radio, or tune in radio.